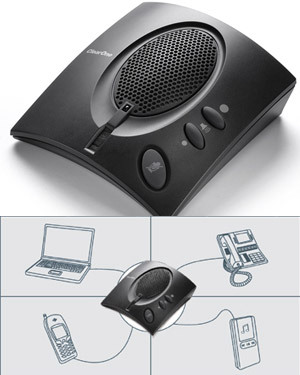 The CHAT 50 personal, USB-powered speakerphone is a mobile audio peripheral that connects to a wide variety of device, providing crystal-clear, hands-free audio for ad-hoc conferencing or audio playback. The small form factor is sleek enough for desktop conferencing, yet rugged enough to be completely portable. Hands-free laptop and cell-phone conferencing are possible any place, any time.